The Monitor's 2018 All-Area Offensive Player of the Year Aaron Galvan, Edinburg Vela, poses at Vela High School on Wednesday, June 6, 2018, in Edinburg. 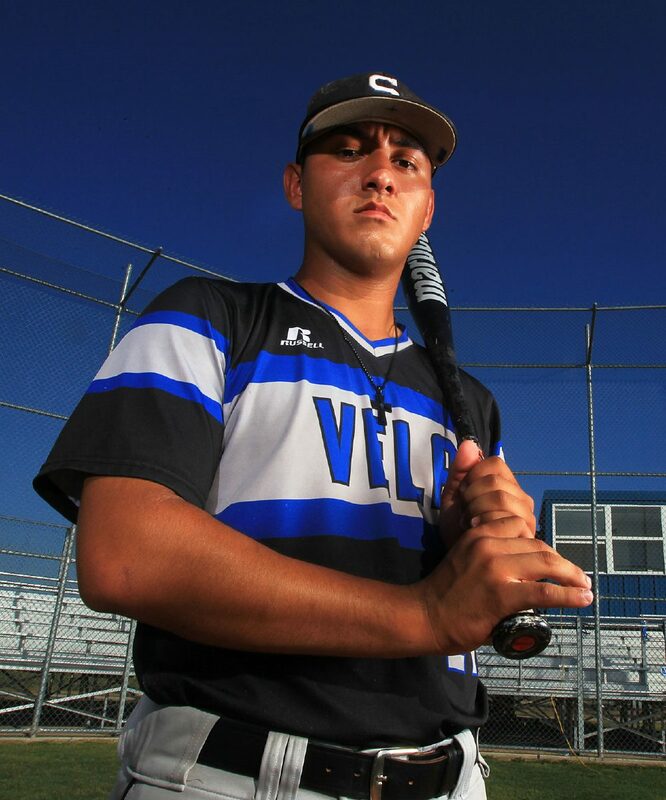 EDINBURG — Edinburg Vela senior Aaron Galvan is at the forefront of a dramatic shift in Valley baseball. The shift begins with his time at Edinburg Vela. He came in as a freshman the same year coach Jaime Perez Sr. took over at Vela. Galvan has been the team captain since then, and Perez often described him as the “heart and soul of the team.” Since that time, the team hasn’t missed the playoffs and has continued to improve. Despite an oblique injury that took him out of about seven games this year, Galvan hit .467. He drove in 37 runs, scored 30 times and hit four of each doubles, triples and home runs. 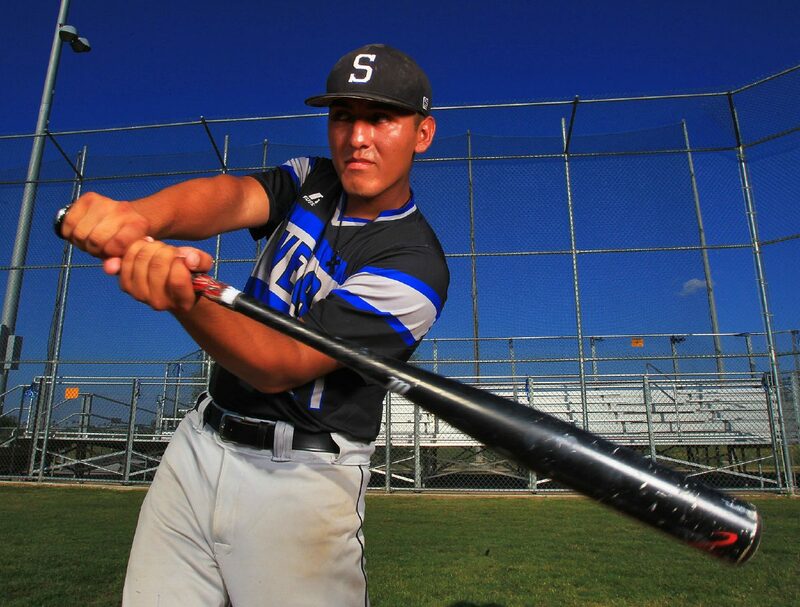 For his overall work at the plate, Galvan is The Monitor’s 2018 All-Area Baseball Offensive Player of the Year. On the hill, he threw 46.2 innings, posting a 3.00 ERA and inducing 80 punch outs. The growth and development of the Vela baseball program in his four years has been groundbreaking. This year, the SaberCats won their first district title and advanced to the fourth round for the first time in the program’s six-year history. The success at Vela, however, isn’t the only movement Galvan is a part of. There is also his commitment to UTRGV. Galvan is at the head of a wave of talented Valley players who are deciding to stay home and play for Division I UTRGV. The Monitor’s Pitcher of the Year, Abanny Garcia (McAllen High) will be heading to UTRGV with Galvan, as will Galvan’s high school teammate and best friend, Ramsey Amador. Amador will join them a year later, as he will enter his senior season at Vela this fall. Galvan originally committed before Matlock got to UTRGV. At the time he was only offered a partial scholarship. Galvan was headed to the Area Code tryouts during the summer of his junior year. “UTRGV called me while I was on my way and said ‘when you get back to the Valley we want you to come for another visit,’” Galvan recalled. “I was excited. I let my dad know. He said ‘well cool, just show out at Area Code and see how it goes.’” Galvan proceeded to hit a walk-off home run and have a great overall trip. The coaches at UTRGV heard about Galvan’s efforts from their scouting connections and were eager to get Galvan in for a meeting. Galvan’s father had to work during the meeting, so Galvan went alone. UTRGV offered him a full scholarship at the meeting. When Galvan got home he relayed the news to his father. Galvan’s father then asked why Galvan hadn’t committed yet, but Galvan had good reasoning. “I said, ‘You are the one who taught me how to be tough and taught me that I would know when the time is right.’” Two weeks later he signed, and now has the chance to help shape the trajectory for UTRGV baseball, and Valley baseball as a whole.